Preparations for Olympia Zine Fest 2017 Table Expo continue. 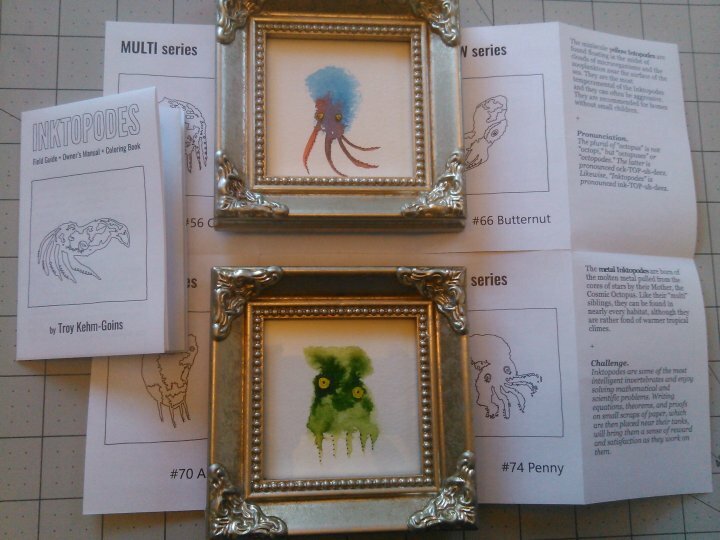 Magus (#36, blue series) and Moss (#48, green series) inspect the test print runs of the “Inktopodes” field guide/owner’s manual/coloring book mini zine to accompany each piece of original art. “Inktopodes” will be on sale for $15 each (framed original art + mini zine) at Olympia Zine Fest from 11am to 5pm on Saturday 14 October 2017 at the Olympia Center, 222 Columbia Street NW, Olympia WA 98501. In addition, Troy’s Work Table will also have poetry chapbooks (My Two Melvilles, Let There Be, All the Heroes Are Dead and Buried, Black Psalms), “Isolatoes” mini zines and mini broadsides (The 1/2 Werewolf, Immolation + Pillar), and coloring books (CHTHONIC) for sale.